Members of Curtin University’s Desert Fireball Network (DFN) team have successfully tracked and recovered a freshly fallen meteorite from a Western Australian farm near Morawa, several hundred kilometres north-east of Perth. Pristine meteorite sample, protected by non-reactive Teflon bag. Quickest yet meteorite recovery by the Desert Fireball Network, so sample has tremendous scientific value. Credit: Desert Fireball Network. 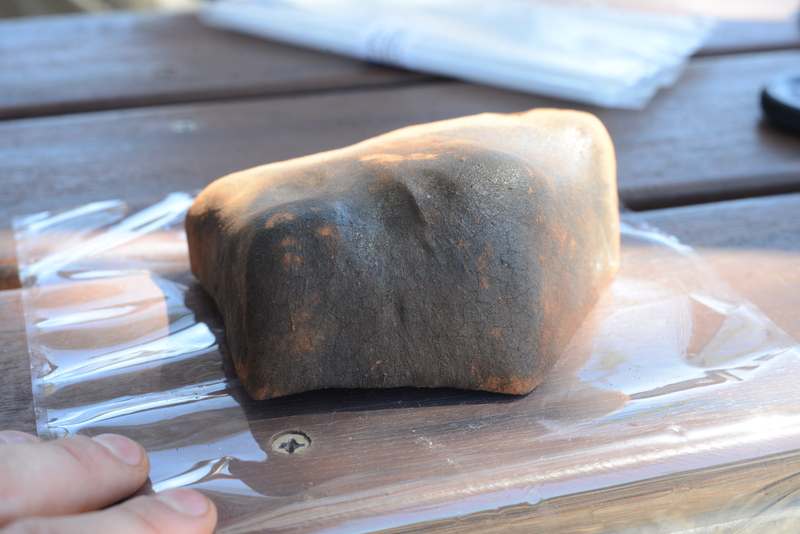 The 1.15kg meteorite, which is shaped like a squished brick, fell to earth at 8.04pm on Monday, 31 October 2016 and was located and recovered within the week thanks to swift reports by members of the public to the DFN’s award-winning Fireballs in the Sky citizen science app, and rapid response by the DFN team. Recovering a meteorite with minimum contamination – e.g. before rain – significantly increases its science value. DFN founder and planetary geologist Professor Phil Bland, of the Department of Applied Geology within the Curtin WA School of Mines, said a report by Stargazers Club of WA founder Carol Redford – also known as ‘Galaxy Girl’ – prompted the team to quickly check the DFN’s web of outback cameras for sightings. Desert Fireball Network camera imaged: 30-sec exposure to pick up the 6-sec fireball event. The fireball was very close to the Perenjori camera (about 40kms), and thus shone brightly on the clouds through the exposed image. Credit: Desert Fireball Network. 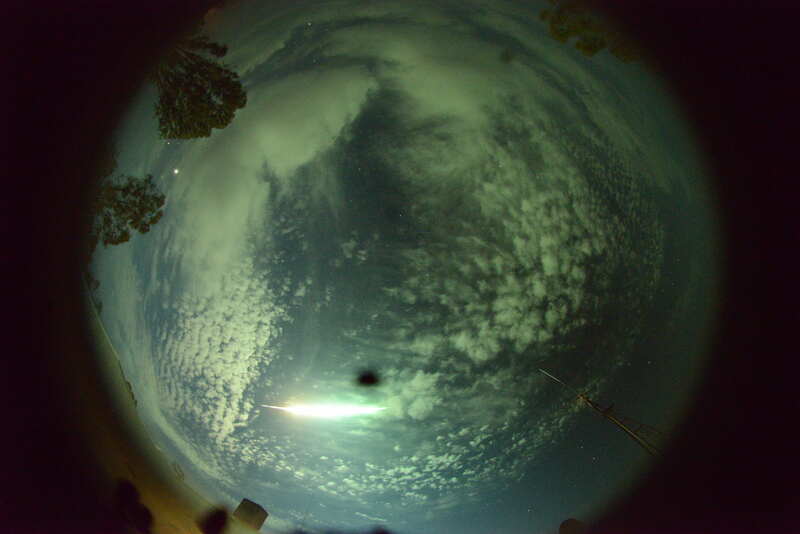 “The fireball was picked up by four of our cameras – in Perenjori, Northam, Badgingarra and Hyden,” Professor Bland said. Professor Bland and Dr. Martin Towner, also of Curtin’s Department of Applied Geology, visited the site on Thursday, 3 November 2016, to obtain permission to enter farms in the area and conduct a reconnaissance. Dr. Towner returned to the area with fellow team members Trent Jansen-Sturgeon, Ben Hartig and Hadrien Devillepoix on Sunday, 6 November to undertake a detailed ground search. “We left Perth early in the morning, arriving at the farms to search in the afternoon,” Dr. Towner said. However, after a full day of traveling and searching, the tired team turned back, deciding to resume the search the next day. “We started on Monday in a different field, traveling by mountain bike and on foot but had no luck and decided to head back to the field from the day before to complete that quadrant,” Dr Towner said. Dr Towner said there were no visible impact features on the ground. Meteorites have decelerated to a free-fall velocity by the time they hit the Earth, traveling at the same speed as a rock thrown from a tall building. The team carefully retrieved the meteorite and brought it back to Curtin for analysis. Colleagues at CSIRO have already conducted CT scanning. Preliminary analyses have so far suggested it is a chondrite meteorite. “We’ll find out much more once we’ve been able to study the 3D model in detail and do chemical analysis on thin sections of the meteorite,” Professor Bland said. CT Scan of freshly found meteorite. Dr. Lionel Esteban (CSIRO Energy) scanned the meteorite using the medical X-ray CT scanner from the National Geosequestration Laboratory. The data were processed by Dr. Belinda Godel (CSIRO Mineral Resources) using workflows developed for ore materials (Advanced Resource Characterisation Facility). 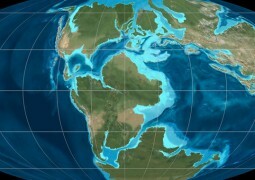 Credit: CSIRO. The find follows the DFN’s celebrated recovery of a New Year’s Eve fireball from Kati Thanda-Lake Eyre in South Australia and is similar in size to that meteorite. “First New Year’s Eve, now Halloween – there seems to be something about holidays that really works in our favor!” Professor Bland said. Under Federal Government law, the meteorite belongs to the State, and the Trustees of the Western Australian Museum will become the custodians. Source: SSERVI Australian team/Curtin U.